Be Prepared. As temperatures rise, be prepared & informed. During the summer, we're checking heat advisories, humidity and heat indexes! There should always be a weather plan b (for rain or extreme heat) if your event falls on an exceptionally hot day. Planners need to ensure all staff are aware of the signs of heat exhaustion and heat stroke. It is especially important to monitor little ones or older guests who may be more sensitive to heat. All vendors should know what the plan of action is should they see anyone getting overheated. Create Cooling Design Elements. 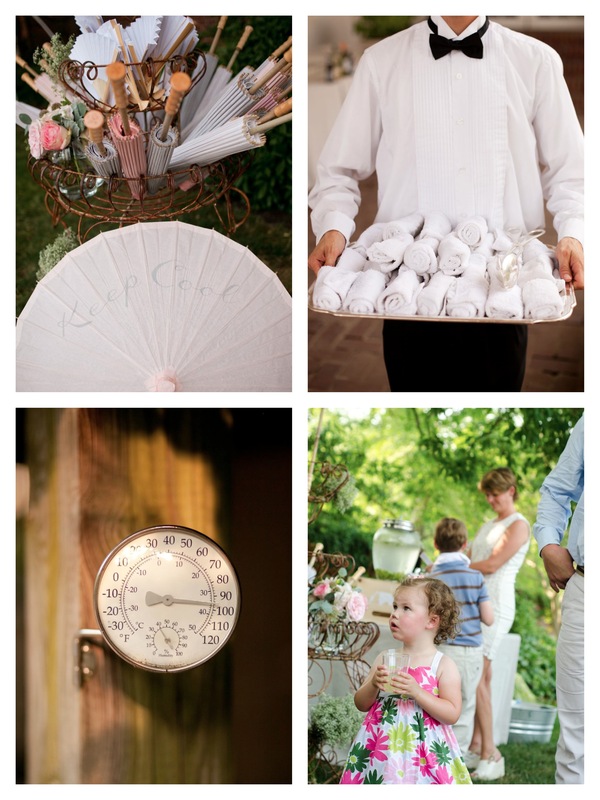 Summer outdoor weddings are a perfect opportunity to add cooling design elements to your event. A cooling station displaying parasols and hand fans (perhaps even with the program printed on them) for guests to grab will be appreciated on a warm day. Greet guests when they arrive with tray-passed chilled towels to cool down with - they'll love this thoughtful gesture! Market umbrellas are a wonderful way to provide shade for an otherwise-sunny spot. Air Conditioning & Fans. Assess the air-conditioning situation at your venue. Ideally, there should be a fully air-conditioned room designated to cool overheated guests off in if needed. If you are under a tent, we highly suggest at minimum adding additional fans to help circulate and cool the air. Tents are tricky during the heat (especially clear top tents) so you'll want to work with your tent provider well in advance to address heat concerns. The additional investment in extra fans will be worth it and is often fairly minimal. If you are at a historic property and accessing additional power than normal, ensure you are testing outlets ahead of time and that you've done a week-of walkthrough with your rental company and venue to address any generator needs or special electrical considerations. Dress Appropriately. If your wedding day calls for exceptionally hot weather, let guests know that you don't expect them to be in jackets all day long. Included a note in your welcome itinerary reminding guests to dress cool for the outdoor venue. Some of our grooms have opted to bring a secondary dress shirt to change into mid-night. Let's face it, no one likes to sweat. And if you are someone who get's hot easily, a mid-event wardrobe change isn't a bad idea! Total justification to purchase that short little dancing dress to change into, right? Photos from Victoria & Michael's River Farm wedding by Brian Tropiano. Anyone working in DC over the July 2011 heatwave (one of the hottest in DC records- EVER) remembers the weekend! Thanks for this post! Just forwarded this over to one of our brides!